Best store in San Francisco to buy beer? I don't have much time in SF but I want to grab some beer that I can't get here in Jacksonville, FL. Namely, Pliny The Elder and any Heretic beers. Any suggestions where I can get the freshest bottles to pack in my checked luggage? 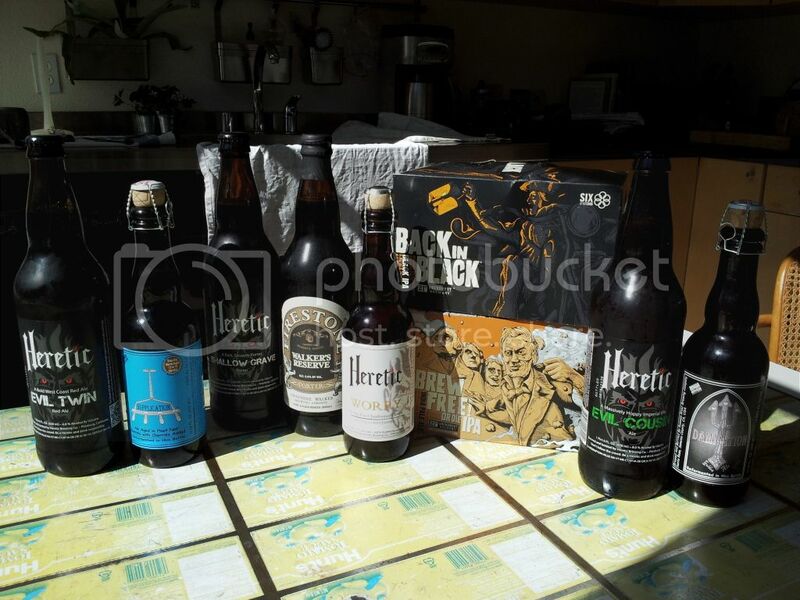 Re: Best store in San Francisco to buy beer? That is true, you can have a draft beer, or drink a bottle off the shelf for $1 over the price. Thanks. That's less than 2 miles from where I'll be staying. Things may have changed since I left but, trader Joe's, bevmo, and whole foods are major retailers. As for a pint, toronado on lower haight. +1 to City Beer store probably the best selection of bottles in the City. Another good place to drink is Amsterdam Cafe on Geary. Not as many taps as Torando but the bartenders are much, much nicer (and better looking). If you are in town tonight my beer group will be there for a get together you are welcome to come. Won't be until the 2nd week of August. I won't have much time, I'm actually spending the week in Mountain View but I have family in SF that I will be visiting for a weekend. Enjoy -- you can find things like Pliny and Damnation even at grocery stores, but City Beer Store is a really good bet. You might even talk a relative into joining you for a little repast! I found a number of beers at Whole Foods. Didn't have time to go anywhere else, but I'll check out a few stores while I'm down in Mountain View this week. I gotta say that Supplication was...um...not good. Maybe some people like it but it just tasted harsh to me. So far the Heretic beers have been the best. The 21A stuff was good. I stopped by the brewery and got their batch 800 imperial IPA which was smooth for a 9% abv beer. I'm taking Walker's Reserve back to Jax with me and I hope I can find some Pliny around Mountain View before I have to leave. Tried a BevMo today and they didn't have Pliny. An employee said they don't get much and it sells out fast. But he suggested I try Knee Deep Brewing's Hoptologist DIPA which was supposed to be a Pliny clone. Drinking it right now and liking. Anyone know how close this is to the real thing? I was in Palo Alto at the beginning of the month and didn't see Pliny anywhere on the Peninsula. I stumbled upon some in a tiny co-op in the Sunset district in the City, though. Not exactly a practical trip for you but oh, my, that beer lived up to the hype. I have a small window Friday to try City Beer. But I think I will call first. If you are willing to travel a little farther north to Santa Rosa, get Pliny on tap and bottle at RRBC on 4th st.
You can get Pliny on tap without leaving SF -- it's at Toronado regularly, and I think usually at City Beer Store, Monk's Kettle, and a few other places. As for on bottle, a number of stores in SF carry it (including City Beer Store, but also spots like the Monterey Deli, a mom&pop). Plus a few places also have Blind Pig on tap, which some days I prefer and is wonderful on tap. Not to say a trip to RRBC wouldn't be worth it on its own! Well, I missed out on Pliny. But I did get to try lots of great beer. Brought back some Firestone Walker for my wife to sample. I reeeeally loved Double Jack.